My sanrio obsession is like an addiction. If we had the money, my brother would definitely put me into therapy for my sanrio addiction. I don't see it as a problem, but to sane people like him.... it is. *~I'm really not kidding about therapy, he would!~* All my thoughts and money go into building my collection. Or at least in my case, seeing pretty sanrio things that I have to own. As an addict, you definitely come up with reasons to justify the obsession. Like if I don't get one now, I'll miss out the chance to get that product(s) later down the road when stores stop selling them. Never mind the fact that I could find it on e-bay years later, but then again what happens if I can't find the item and it becomes a rare item because everyone isn't selling theirs.... blah, blah, blah. I give myself too much stress and headaches with all this insane thoughts. Thankfully, my addiction has some control. It's the fact that I'm picky, picky! Darn picky! I'm not really a picky person in the general sense of life, but when it comes to collecting-- I am. 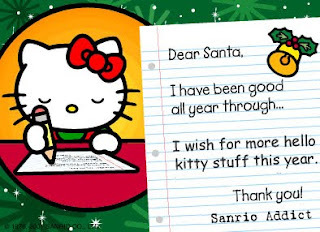 It's why I think my brother doesn't even try to buy me any sanrio presents unless I give him a list of sanrio choices to buy for Christmas. If I wasn't picky at what I collect, I'd be in a lot of trouble financially at wanting everything, any time, any place! I do get remorseful about all the money I have spent on sanrio when I could actually have already tons of money sitting in the bank, waiting for my brother and I to go on our very first out of state vacation trip. I've always wanted to go to Disney World and stay there for at least two full weeks. It sounds exciting, right? And, good common sense? Not to this sanrio addict. For me, my obsession is worth all the hard earned money and time spent. My brother is waiting for me to get tired of collecting sanrio and at times, I fear I will grow out of my addiction. Thankfully, I can say, "not today, not today!" Where are the good quality Pens, Sanrio??? Hear It Loud & Clear! Are You Ready for X-mas?